Dreaming of an Easter Bunny? Adopt, Don't Buy! Every year around this time, the commercial world slaps pictures of beautiful tiny baby bunnies all over everything. Pictures with the Easter bunny, Easter egg hunts with live bunny meet & greets, and so on. And you can almost hear the children all together in a chorus: "Mommy, can I have a bunny?" Resist the temptation to buy them a baby bunny from a store* just to make them happy. This is the perfect teachable moment for your kids on responsible pet ownership and shelter pet adoption. Here's why Easter and the few months thereafter are such a headache for shelters like ours that accept rabbits. The Vanderburgh Humane Society is currently overwhelmed with bunnies. 25 to be exact, between the shelter and foster care as of April 2nd. We do not have a time limit for our animals, but we do only have so much space and so much manpower. Rabbits are time-consuming and expensive to care for. Why are there so many needing homes? Additionally, it is very difficult to determine the gender of young rabbits. Sometimes, through no fault of their own, sales staff at these establishments have no idea if rabbits are males or females and often send home pairs of opposite genders by accident. And since rabbits reach sexual maturity at anywhere from 5-8 months of age, it is highly possible to purchase a pregnant young bunny from the store. This happens regularly right here in our community! Many new rabbit owners end up with accidental litters that they must then surrender to shelters. Rabbit litters can have anywhere from 4-12 kits. Female rabbits can get pregnant again within minutes of giving birth because they are induced ovulators. Their gestation periods are roughly 30 days. This means that theoretically, if an unaltered male and female are kept together, they could produce 4-12 bunnies every month or so. This adds up quickly. And lastly, the average rabbit's lifespan is 8-10 years! Sometimes people tend to think that they are short-term pets similar to hamsters or mice. This is not correct. Your new rabbit will easily see your kids through to high school and even college. If you have a 9-year-old child who wants a rabbit and you get them a baby one... you, the parent, could be caring for the rabbit even after they leave home! Adopting a bunny is a long-term family commitment that everyone in the house should be on board with, come what may. Rabbits can be trained to use a litterbox. They require several hours of exercise per day. Provide your rabbit with a box filled with soil or shredded paper to dig in. Provide your rabbit safe things to chew on, such as phone books, cardboard boxes, timothy hay, or commercial chew sticks sold at most pet stores. In America, traditional housing for a rabbit used to be an outdoor hutch made of wood and wire mesh. But that's not the safest option for domestic bunnies. Proper housing for a pet rabbit is an indoor cage at least 4 feet wide, 2 feet tall, and 2 feet deep. The bottom must be solid, because mesh or wiring can ulcerate rabbits’ feet. Never leave your rabbit outside unattended, even for a moment! Predators such as hawks, foxes, or even neighborhood dogs & cats could be watching closely nearby. When you adopt, you also get a rabbit that you know has been handled and socialized daily. Our Adoption Counselors are prepared to educate you on proper rabbit care, equipment, handling, and health so that you and your new companion can enjoy life to the fullest together. They can also help you make a good match for your family based on your kids' ages and the bunny's personality. We currently have rabbits of a variety of ages, sizes, breeds, genders, and colors to choose from. 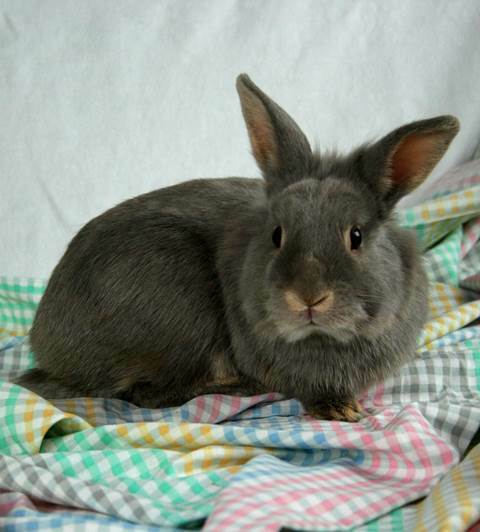 If your family is ready for a new indoor bunny companion, we would love to have you! View adoptable rabbits at the VHS here!